Dubbed “Nature’s Playground,” Morganton is the county seat of Burke County and lies in the foothills of the Blue Ridge Mountains on the banks of the Catawba River. The Blue Ridge Parkway, Pisgah National Forest, and the Linville Gorge are all a stone’s throw away, and Burke County is home to two state parks – Lake James State Park and South Mountains State Park. While rural outdoor recreational opportunities are abundant, Morganton has also seen an increase in downtown walking and biking, both on the 4.8 miles of paved greenway and on the roads. The county has numerous schools that children can access by walking or bicycling. Morganton joined the Watch for Me NC program to complement the town’s existing roadway improvement initiatives with public safety messaging. Morganton Public Safety partnered with multiple law enforcement agencies in the area, including the North Carolina Highway Patrol, the Burke County Sherriff’s Office, and the Drexel Police Department. Coordination with Morganton’s Housing Authority provided a way to reach low income residents in the community. Morganton also worked with Burke County Public Schools and the Safe Kids chapter of Burke County to extend the message into middle and elementary schools. So far, Morganton has conducted several successful education and enforcement operations. Schools and the local business community are especially supportive of the program. Watch for Me NC partners held bike Safety Clinics at two schools. Police officers have worked to educate all road users about their surroundings and often engage motorists during events such as Walk to School Day. Additionally, Morganton Public Safety partnered with Safe Kids Burke County to host a bicycle rodeo that involved teaching youth about safe riding techniques and proper helmet wear. Morganton’s enforcement operations have focused on crosswalks in downtown, where there are several crosswalks and there is a history of pedestrian and vehicle crashes. 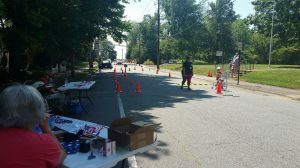 The Morganton Police Department has conducted targeted pedestrian operations, where motorists who fail to yield to officers acting as pedestrians are either given educational materials, citations (if warranted), or both. In the future, Morganton plans to expand enforcement operations to outlying school zones with crosswalks. The police department also plans to increase activities that encourage pedestrians to properly use crosswalks and educate bicyclists about North Carolina’s new bicycle laws. To reach a broad audience, Morganton has used billboards and clean graffiti to display Watch for Me NC information. Program partners also worked with downtown businesses to display and distribute materials to employees and customers. Watch for Me NC materials have been available at several public events as well, such as the Historic Morganton Festival and local running events. In reflecting on Morganton’s Watch for Me NC program, Traffic Officer Jeff Gillstrap remarked, “The community was very supportive of our efforts.” Morganton’s Police Department now has a more thorough understanding of pedestrian and bicycle safety issues. Officer awareness has increased and officer interaction with the public on pedestrian and bicycle issues has improved. Due to the Watch for Me NC program, the Morganton Police Department is prepared to expand its education activities. The police department is currently working with Safe Kids Burke County to organize bicycle rodeos. Another outcome of Morganton’s involvement with the Watch for Me NC program is the budding partnership between Morganton’s Police Department and the Street Department to identify crosswalks ripe for infrastructure upgrades. This partnership has already resulted in the installation of a crosswalk near the courthouse downtown and the city is currently considering additional marked crosswalks downtown. The Morganton Police Department has also talked with school officials about engineering options for improving safety in school zones. Build on positive momentum: Morganton plans to use the community’s positive reception to the Watch for Me NC Program to strengthen existing partnerships. Know which materials work: According to Traffic Officer Jeff Gillstrap, “The billboards and clean graffiti were a big hit with the public.” Knowing which materials work best has helped Morganton plan for future Watch for Me NC marketing campaigns. Education and enforcement is critical: Morganton has areas of downtown where people fail to use crosswalks even when they are very close by. City staff plan to ramp up education efforts to encourage proper crossings. Thank you to Traffic Officers Jeff Gillstrap and Kim Davis with Morganton Public Safety for providing leadership, time, and expertise that contributed to the Watch for Me NC Campaign in Morganton and the writing of this profile.